Check On call it 'Dinner', I call it 'Lunch', but whatever you call it, there are three nine of them planned for January and February (& now also March) at The Dead Dolls House in Hoxton Square, featuring Chicken, Pork and Beef. It's just £25 for 4 courses - menus here - but bring cash for drinks too of course. 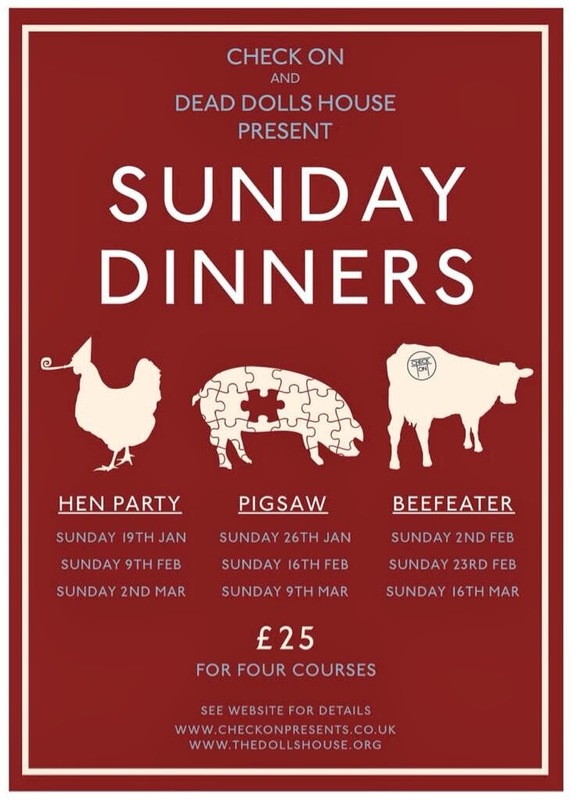 "What we eat on a Sunday is always a very important decision, whether its because you're nursing last night's hangover or just simply looking for somewhere to go for a top quality roast, which is why we are bringing you SUNDAY DINNERS.. Check on style. We are returning to The Dead Dolls House on Hoxton square to serve up our roasts in the new year, we love it so much there! On offer we have 3 completely different menus which take place on separate dates. The menu's are all 4 courses for £25 and are based around the main meat dish which we are serving up that week.. so take your pick and we will see you there!"